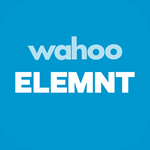 The Wahoo Fitness ELEMNT App is the essential supplement for your new ELEMNT MINI Bike Computer. The ELEMNT MINI is the latest in the series of Wahoo cycling computers. This streamlined design enables you to measure speed, distance, cadence, heart rate and connects to your smartphone for enhanced features such as call and text notifications and live tracking. The ELEMNT MINI package includes a Wahoo RPM SPEED Sensor and is engineered to be used with the ELEMNT App. Our free app allows you to customize your ELEMNT MINI screens, track your past rides, authorize 3rd party workout sites for your workouts to be automatically uploaded post ride and, if utilized during a ride, will record your workout in real time. If you choose not to utilize the app during the workout, the ELEMNT MINI saves your ride and uploads summary information via Bluetooth to the app when your workout is complete. You do not need to have your smartphone to use the ELEMNT MINI. The app is only necessary to utilize enhanced features such as Live Tracking and Full Ride GPS workout data. Left button: Use to power on/off and also manage your workout. Hold down for 3 seconds to access the prompt to power down your device. Right button: Functions as the page toggle to switch between workout data. Turn on by pressing either of the two buttons located on the front of the device. After loading, a QR code will be displayed. Choose to either pair your ELEMNT MINI to your smartphone or ride in Stand Alone Mode. Instructions for each section are outlined below. You MUST pair your RPM Speed Sensor if riding in Stand Alone Mode to get speed and distance data. See the ‘Add Sensors’ section of this manual for detailed instructions. The ELEMNT MINI will now prompt you to scan the QR code displayed. However, select Skip to defer scanning the QR code to continue use in standalone mode. Ensure your Apple device has been updated. The ELEMNT App will run more efficiently on an updated operating system. Open the ELEMNT App after downloaded. Watch the introductory welcome video or skip to continue to the ELEMNT MINI setup and tutorial within the app. Pair your ELEMNT MINI with your smartphone by scanning the QR code displayed on the ELEMNT MINI by placing the ELEMNT MINI in front of your phone’s camera with the ELEMNT App open (there will be a viewing window in the app). If prompted, grant the ELEMNT App access to the camera. Authorize your favorite fitness sites and the ELEMNT App will automatically upload your rides via Wi-Fi or Bluetooth if your cell phone has data service. Alternatively, select Next and add these later. Complete a basic profile to be used with the ELEMNT MINI. This information will be used to calculate metrics such as calories and HR zones. Alternatively, select Next and add these later. NOTE: If an update for the ELEMNT MINI exists, you will be prompted to perform one now. Select Update Now to proceed, or select Later to update your device at another time. Ensure your Android device has been updated. The App will run more efficiently on an updated operating system. Add sensors to gather more information during your workout and get a more comprehensive report about your ride. Sensors gather a variety of information including speed, heart rate & cadence. To get you started, the ELEMNT MINI comes with the RPM SPEED sensor. Set your Wheel Size (in millimeters) when prompted for more accurate results. NOTE: If you start your workout without waking up your additional paired sensors, you can still wake them and they will begin to send data. The ELEMNT MINI comes with a stem mount to attach to your bike. Simply use the zip ties included to secure the stem mount in place in your preferred location. You should be able to read Wahoo while seated in the saddle. To operate the mount, place the ELEMNT MINI into the mount and twist to secure in place. To remove, twist firmly in the opposite direction and lift to remove from the mount. The RPM SPEED arrives ready to fit to the hub of either wheel as per your preference. To attach, hold the mount in place on your selected hub and gently stretch the strap portion of the rubber shim-strap around the hub and secure using the bottom two hooks on the mount. When installed correctly, the Wahoo RPM SPEED should not be in contact with any other parts of your bike. Back: Return to the workout screen. Forget Phone: Forget your current pairing and reinitiate the pairing process. Sensors: Access the Sensors menu to manage your Sensors. Back: Return to the previous menu. Find Sensors: Select to initiate a search for nearby sensors. Forget Sensor: Select a Sensor to Forget a sensor pairing. Sensor Info: View the Sensors paired with your ELEMNT MINI. System info: Displays system information, battery life, and total distance recorded (which can be reset). Certification: Displays current version, model and certification information. Uploading of workout data occurs automatically via the ELEMNT App using Bluetooth. Once uploaded to the app, uploads to third party sites can be automated as required. For more information, read about Uploading Workouts in the ELEMNT App section of the User Information Guide. New app & firmware updates will become available periodically, with notifications in the ELEMNT App. When notified that a new update is available, accept the update to ensure your device functions at its best. Alternatively, manual installation of app and firmware updates can be accessed later via the app Settings menu if required. It always recommended to stay current on the latest version for optimized performance and capabilities. The ELEMNT MINI can work in conjunction with your smartphone and display notifications during your workout, as per your preference. If activated, phone calls and SMS alerts will be temporarily displayed during your ride, and be accessible from the Settings menu. NOTE: We recommend removing the screws on a flat, white surface or in a shallow tray to prevent loss. Should the ELEMNT MINI require cleaning, use a moist soft cloth or similar to remove any debris. Strong cleaning agents are not recommended, as this may damage the device or reduce its lifespan.